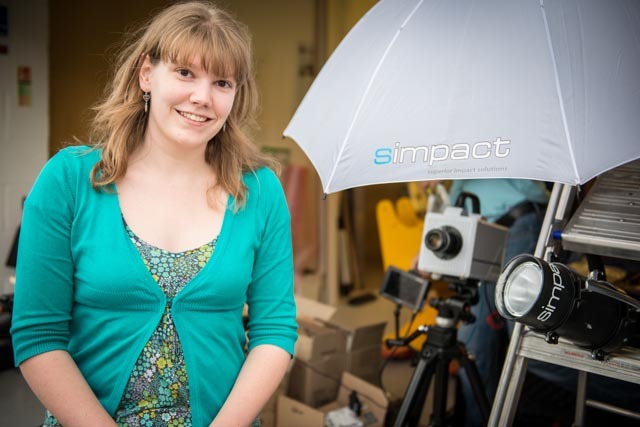 In 2014 Simpact invested in the Photon SA1.1 high speed digital camera. This is an exciting piece of equipment which provides blistering fast speed. It is capable of over 5,000 frames per second (fps) at full resolution and 650,000 fps at reduced resolution. We have extensive experience in the use of high speed photography for FEA correlation and test validation. Before purchasing our own system, we made use of rental cameras and those owned by test houses. We opted for a colour CMOS sensor as although this is less sensitive than a monochrome sensor, it covers a larger market and achieves impressive filming outdoors. Our high speed camera is highly portable but also fully integrated with our impact test facilities and we have developed mirrors and mechanical triggers so that we don't miss that crucial moment. A lot of good quality light is one of the most important ingredients required for superior quality high speed video and in 2015 Simpact designed and developed ICARUS, an innovative LED light specially designed for high speed camera and high end photography applications. It had a super bright flicker free 6000 lumens LED and a 13deg beam angle. Being lightweight (less than 1kg), compact and ergonomic and having a quiet cooling fan and cool LED made it ideal for experiments where heat is undesirable. In 2018, ICARUS was upgraded to produce an impressive 12000 lumens. For more information about this product, please visit our Products area.